There have now been over 1,800 downloads of the Field Guide, and we're beginning to get some good questions, comments, and suggestions from readers. 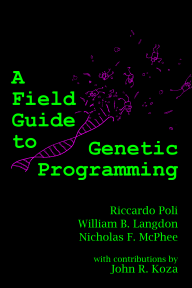 It seemed like we probably wanted to set up some sort of system to help manage and archive that data stream, so we've created a discussion group for the Field Guide: http://groups.google.co.uk/group/field-guide-to-genetic-programming. Feel free to subscribe if you've got feedback on the book that you'd like to share, or you'd just like to see other people's feedback. I would assume that the traffic on the list will remain light, but that's really up to you folks.